We have gained immense recognition in the industry by offering a quality assured range of Light Weight Square Cap. The offered cap is available in different shapes, sizes and designs as per the choice of our clients. 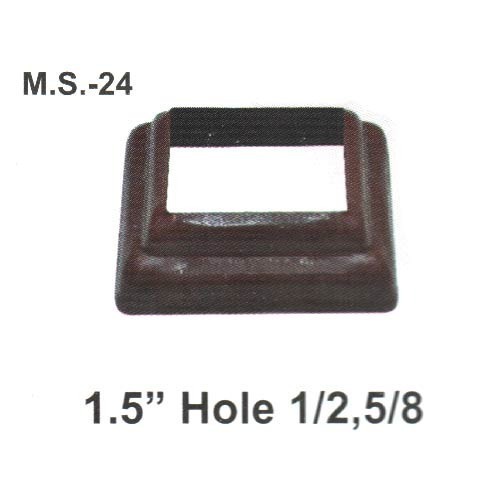 This cap is manufactured under the knowledge of our skilled professionals using quality approved raw material and ultra-modern techniques. Also, this cap is tested on different parameters to ensure its high strength and fine finish. The offered cap is available with us at affordable price range. Located at Rajkot (Gujarat, India), we “Manidhar Engineering Corporation” incepted in the year 1992 are occupied in Manufacturing and Supplying a comprehensive assortment of Light Weight Railing Balls, Heavy Weight Railing Balls, Light Weight Round Railing Base Balls, Heavy Weight Round Railing Base Balls, Light Weight Square Railing Base Balls, Heavy Weight Square Railing Base Balls, Light Weight Round Railing Caps, Light Weight Square Railing Caps, Light Weight Round Railing Center Points, Light Weight Square Railing Center Points, Heavy Weight Round Egg Railing Baseballs, Heavy Weight Square Egg Railing Baseballs and many more. Under the headship of our Proprietor “Mr. Bhavin Patel”, we have been able to maintain top-notch position in the industry. His deep knowledge and rich industrial experience have enabled us to reach new heights of success and fulfill various requirements of clients within committed time frame. We follow fair business policies and maintain transparencies in all our business dealings due to which we have garnered a huge client base across the nation. In order to design and manufacture products of global quality, we have established a state-of-the-art infrastructural base that includes units such as procurement, production, quality control, sales & marketing and warehousing & packaging.